Protect your Toyota Camry from the heat with a professional tinting job from Sunray Tint – call today for your FREE estimate. How does automotive window film for Toyota Camry Auto Tint work? It’s what’s inside that counts. 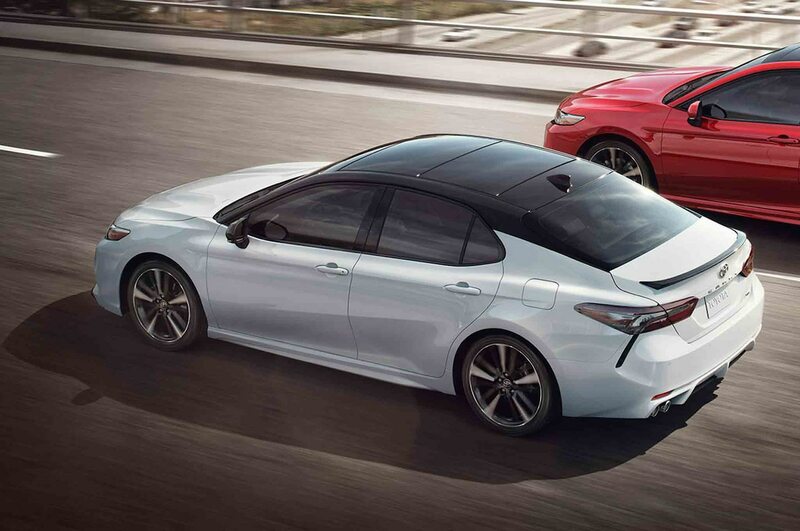 Automotive window tint for a Toyota Camry is a sheet of strong polyester laminate treated in variety of ways to improve the look and performance of existing windows. One side has a scratch-resistant coating and the other has an adhesive that bonds to the glass window. Many people think that window tint is just for appearance, it’s not! Window tint does make your car look great but it also rejects heat from the sun, blocks damaging UV rays, reduces glare, and keeps you and your family safer since it bonds the glass to keep it from shattering in case of an accident or outside blow. There is a perfect tint shade for every car. Some people like the film darker for more privacy and glare control. Some people like it the same shade all the way around for a “classy” look. Llumar auto tints are available in a variety of shades and colors making it easy to accent the look of your car, while taking advantage of the pinnacle of tint technology. There’s no better combination of quality, function, and looks in automotive films anywhere else. If you’re looking for a tint that provides disruption-free use of your cell phone, GPS, and radio, our ceramic films were developed to do just that—with the quality you’d expect from Llumar and Sunray Tint and it’s guaranteed for life! Whatever your desire, Sunray Tint has the right combination for you! Don’t settle for anything less than the best in automobile tinting. Call today for your FREE estimate on Huper Optik Films. Hüper Optik Automotive Window Films exceed your expectations with their superior performance. In addition to improving the overall comfort of riding in your vehicle, these films offer fade control and extend the life of your vehicle’s interior. By cutting out excessive glare to the eyes and cancer-causing rays to the skin, occupants are protected from the harmful effects of the sun. And by cutting down unbearable heat, these high performance films cool the vehicle more efficiently and reduce fuel consumption. The Hüper Optik nanotechnology Auto Window Tinting gives your vehicle an exquisite and classic European look, enhancing the overall aesthetics and improving your driving experience. We offer a customer loyalty program and various ongoing discounts. Enhance your vehicles aesthetic look with a true dark smoked look of Llumar CTX series window film; our most popular series. CTX series Llumar CTX™ Films use Ceramatrix™ Advanced Technology which provides maximum heat reduction as well as excellent optical clarity and blockage of infrared rays while allowing optimum performance at all frequencies. Therefore, there is no hinderance to vehicle electronic systems and will not interfere with radio frequencies or any other electronic devices. A dyed series unique in design that gives the greatest color longevity of any non-metal film offering a no-color change warranty. Special dye formulations gives you a soft charcoal look in a variety of light transmissions. This film has 32-42% heat rejection properties. Even if your side windows are tinted, you’re still missing an important level of protection from the sun: the front windshield. LLumar Air Blue 80 provides extremely effective protection against ultra violet rays and infrared heat that can penetrate ordinary window glass. LLumar Air Blue 80 is a non-metalized, non-conductive ceramic technology film with 43% heat rejection, maximum ultra-violet rejection, excellent optical clarity, and scratch- and corrosion-resistant properties. This film has a 78% Visible Light Transmittance, and its optical clarity and low reflectivity AP-Window-TInting-LLumar-Air-Blue-2will not interfere with night driving. Air Blue 80 will also block 99% of the sun’s UVA and UVB rays and is recommended by the Skin Cancer Foundation. This film also has signal-enabling properties to ensure no signal interference with wireless devices. With fuel costs on the rise, every opportunity for savings is crucial. By reducing the interior temperature of your car, LLumar Air Blue 80 films can reduce the need to run your vehicle’s cooling system, and that helps your car burn less fuel. Since tinting windshields is illegal in most states, LLumar Air Blue 80 is perfect for your windshield! It is virtually clear and will still provide excellent heat reduction. If you don’t like the appearance and darkness of tint, we can also apply LLumar Air Blue 80 to your whole vehicle! We’ve installed LLumar Air Blue 80 on cars, trucks, vans, and SUVs. We also offer sunstrips for your windshield. All patterns are cut with our computerized cutting system. Our library of digital patterns includes most current makes and models as well as many older body styles. Our tint kits will fit your car like a glove. In the event that the cutting system doesn’t have a perfect fit for your vehicle, all our installers are experienced where they are able to hand cut if necessary and your vehicle will still have that special custom look. To help your vehicle stand out even more, we offer an array of stripe kits to “customize” and bring out your style. Reject the heat and add some style to your car with auto tinting from Sunray Tint!